As a busy mom, I know how messy the house (and the kids) can get. We’re constantly dealing with scrapes, sickness and plain old dirt. Tea tree oil is one of the staples that I keep around to tackle all of these issues. Tea tree benefits are numerous. I’m sharing some of them so that you can see how one bottle can replace several beauty and cleaning products, save you money and improve your health. Tea tree oil kills microbes in the washing machine, which can be one of the dirtiest places in your home. If your clothes sit in the damp washer for too long, they can grow mold and develop odors. Adding tea tree oil to the cycle can help clothes and linens come out clean. Add 3 to 10 drops of tea tree oil to detergent to remove odors and microscopic organisms that may be lurking in your laundry. Use it in your laundry to eliminate dust mites on bedding and towels. To eradicate dust mites in your carpet, combine several drops of oil with a few tablespoons of baking soda. Sprinkle it on the rug, and let it sit for 10 minutes before vacuuming. Just be careful if you have pets. Tea tree oil is not safe for dogs or cats in high doses. You can use the shampoo or spray to prevent lice from returning after an infestation. If the white flakes on your scalp are caused by a fungus, tea tree oil can help cure this irritating and embarrassing problem. It has antifungal properties that can kill pityrosporum ovale, the type of yeast responsible for some types of dandruff. Tea tree skin treatments can help with acne. It can cleanse the skin, preventing new lesions from forming, and combat the bacteria in existing pimples. This can lead to a reduction in the severity of acne as well as the total number of spots. This video shows how to use tea tree oil correctly to treat pimples. Therefore, it can relieve itching that’s caused by an allergic reaction. You can use this oil on insect bites, stings, poison ivy, poison oak, poison sumac and hives. To use tea tree oil for insect bites, add four drops of the oil to a cup of cold water. Apply to the skin as needed. Keeping the water in the refrigerator can also help. The cold temperature can soothe the itching. Tea tree benefits you whether you’re applying it topically or diffusing it into the air. It can kill microbes that you might breathe in, which makes it ideal for use in your home during cold and flu season. Tea tree oil has also been studied for its effectiveness in treating burns. It can reduce the temperature of the skin, especially when an air current was passed over it. (17) This can help cool the area and helps relieve a sunburn. Tea tree oil was not found to help with scarring from burns. Like I mentioned before, I have used this oil in a variety of ways. I keep a spray bottle filled with about three cups of water, ½ cup of white vinegar and 10 drops of tea tree oil with my cleaning supplies. I use this to disinfect my countertops and bathroom. It cuts through grease and leaves everything feeling squeaky clean. The first time I used it on a cut, I was nervous that it would sting. It probably would have if I hadn’t diluted it. But I wouldn’t recommend putting straight tea tree oil on your skin. I diluted one drop of the oil with 10 drops of water, and it didn’t hurt a bit. My family’s cuts and scrapes always heal nicely when we use this oil. We also take care to bandage them well, though, so it’s hard to tell if they would have healed properly anyway. Still, it’s nice to have reassurance that we’re doing what we can to fight bacteria. One of my favorite tea tree uses is in the laundry. What busy mom doesn’t experience that moment when you go to throw some clothes in the washer and realize that you left a wet load in it two days ago? The smell hits you as soon as you lift the lid, and it seems to stick around no matter how many times you put it through another cycle with a ton of soap. Tea tree oil not only gets rid of that musty smell that permeates the fabric, but it also prevents those pesky mold spots from growing. It also helps my workout clothes smelling fresh even after I’ve sweated in them quite a bit. I mix a few drops of tea tree oil into my shampoo when my scalp feels dry or gets flaky. It’s an easy thing to keep on hand, and I can use it with my regular shampoo. This always makes me feel better when I get that email from school saying that lice have been found on one of the kids’ heads. Below, I’ll share a few of my favorite tea tree oil uses. Cleansing your face and body with a tea tree oil solution can help fight odor, combat acne and soothe skin. A tea tree oil soap provides the benefit of additional targeted ingredients that are designed for use on the skin. TheraTree Tea Tree Oil Soap With Neem Oil is an organic product that contains no synthetic chemicals. I keep some in the shower so that I always have it available. This product is extremely concentrated; you only have to use a small amount. I like that it’s gentle enough to use on my face or body. Whenever I have breakouts on my back, this clears them right up. It doesn’t produce a thick lather because it doesn’t contain harmful sulfates. However, if I use this with a bath puff or body sponge, it gives off lush foam. I like having a bottle of tea tree oil on hand so that I can use it in a variety of ways. The ArtNaturals therapeutic grade melaleuca oil comes in a bottle with a dropper, which makes it easy to add to my cleaning solution, laundry detergent, shampoo or diffuser. I don’t have to guess how much I’m using, which helps me keep myself and my family safe. The oil is 100% pure and doesn’t contain additives or fillers. Therefore, I know that I’m getting the best concentration, and I can dilute it as I see fit. Treating foot fungus can be frustrating. Using a tea tree oil soak can help treat athlete’s foot. Its soothing qualities can have a cooling effect on the skin, which minimizes itching and burning. Even if you aren’t plagued by tinea, you might find a tea tree oil foot soak relaxing. 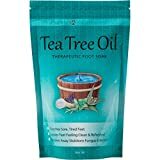 This tea tree oil therapeutic foot salt with Epsom salt softens calluses and reduces foot odor. It is also an effective treatment for cracked heels. Soaking your feet before exfoliating them can get rid of dry skin, and the tea tree oil in this foot soak prevents the cracks from becoming infected. It should NOT be taken by mouth. Ingesting even small amounts may result in toxicity to animals and humans. This essential oil cannot be used with children under the age of 3, and not recommended during the first three months of pregnancy. Tea Tree essential oil is irritating to the skin, always dilute it in a base oil before dermal application (80% base oil with 20% essential oil). Due to the epileptogenic risk, people with epilepsy must seek medical advice before use. This essential oil may cause dermatitis, test it before use it on a regular basis. Store your Tea tree essential oil out of direct sunlight. As always you should only use 100% pure, premium grade, and organic essential oil. Are you surprised by all of the uses of tea tree oil? The fact that studies have proven these benefits makes me feel good about using tea tree oil for everything from cleaning to skin care. If you’ve tried tea tree oil or have other ideas for ways to use it, please feel free to leave a comment.